What if you had an addiction to a substance for which there was no rehab? What if you couldn’t tell anyone about your addiction? In Tee Rutledge I may have created the ideal fictional addict, but there are many correlations to real life addiction. First of all, she has no idea that swallowing one forbidden coffee bean will addict her to them. She doesn’t even realize she is hooked until some time later. She tries to fight her addiction, but she can’t. The lure of the bean and the transformations they cause while she’s under one’s influence are stronger than her will. She hides her addiction (sound familiar?) and covers up what happens during her transformations because she’s quite certain no one would believe she’s addicted to coffee beans, of all things, or that after swallowing one she temporarily turns into…something else. A fly on a wall, or a butterfly or a cockroach. The power she gains through her addiction is addictive. She was warned, however, by the package before she opened it, but she didn’t heed the warning. Like a kid picking up his first cigarette, the caution that it is hazardous to his health goes unheeded. Just one won’t hurt me. Next thing you know he’s hooked and it’s a pack a day. In spite of all the warnings about drugs and alcohol, all the “preventative” measures we take to inform children in this country about the negative impact of even trying them, we are a nation full of addicts. I come from a long line of addicts, alcoholics mostly. My father told me the story of experiencing his first beer at age ten when his father took him into a bar and bought him a bowl of beer. This was after they’d driven the wagon from the farm into town. Can you imagine how my father must have felt after that beer? Warm and woozy and spending time with his dad one on one. My dad was the eldest of five children and grew up on a farm in the Midwest during the Depression. Of course he must have associated drinking beer with one of his best, happiest memories. Nearly everyone on his side of the family drank beer. Some of my cousins and some of my siblings are or were alcoholics. One of my brothers explained addiction to me this way: There is no gray area for him. It’s all or nothing. He’d been through rehab for alcohol and drug addiction. He kept his nicotine addiction because it was the last vice he had left and he wasn’t about to give it up. If he found something he liked (frozen lime fruit bars, for example) he’d consume an entire box. He couldn’t have just one. Working in a coffee shop, I am surrounded by addicts. I don’t know if it’s the caffeine, the ritual, the cup, the flavor or what exactly the customers are addicted to. Perhaps all of those and more. If you’ve ever watched Intervention or read accounts of drug addicts, part of the addiction is the ritual, the needle or the pipe, the preparation. It’s almost better than the high. I think this is true of many coffee customers. It’s the ritual of waiting in line, moving closer to the counter, exchanging cash for a cup of fresh brew. It’s fascinating to watch the interactions that occur on a daily basis. Tee, also, is weirdly mesmerized by those forbidden beans with their unidentifiable coating. She develops a ritual of hiding in the storeroom, opening the bag of beans, withdrawing one, examining it, tasting it, rolling it on her tongue, despising her inability to stop consuming them. In later blogs I’ll try to explain how the Grinding Reality series idea came about. 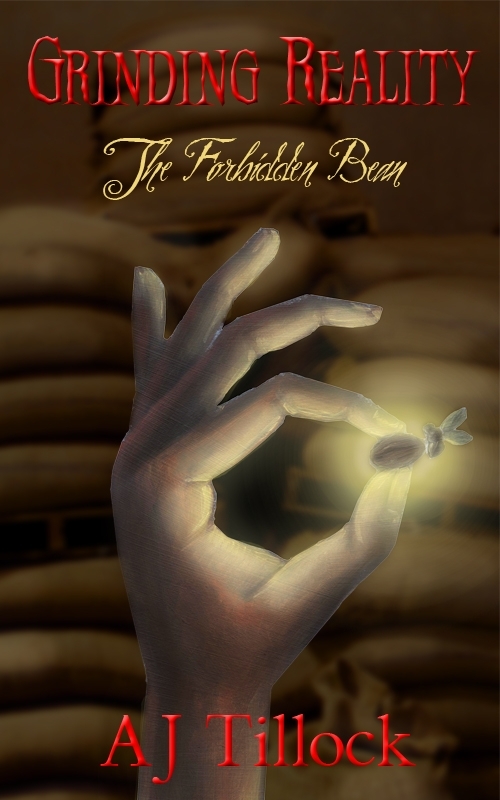 For now, I hope you enjoy reading The Forbidden Bean. In fact, I hope you become addicted to it. addiction, aj tillock, barbara meyers, coffee, grinding reality, the forbidden bean. Bookmark.